This is one of the prettiest picture frames I have. The colors are pretty and it's a fun frame for a special great granddaughter's kindergarten picture. Kamal has made several of my favorite frames and always makes a quality product that will last for years. 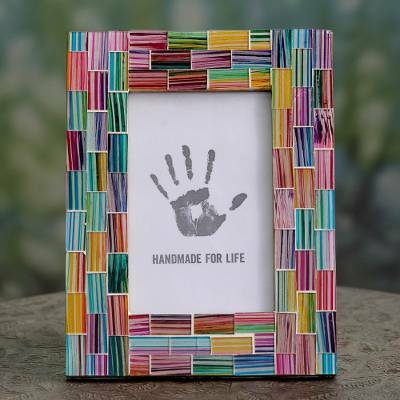 "Sister loved the INDIAN RAINBOW frame!" I sent this frame to my sister and she called me up and said it was absolutely STUNNING! She said she couldn't stop looking at it. She is very impressed with the artistry and said she wanted to read more about the artist. Wonderful job by the artist. Great present!